Step inside the frontlines of the hit TV show Mr. 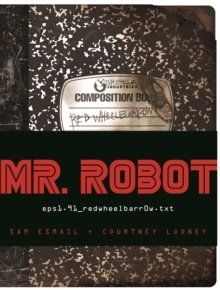 Robot with this new in-world fiction book by series creator and showrunner Sam Esmail and series writer Courtney Looney-the first and only book to tie in to USA's Golden Globe (R) Award-winning series. The book will tell a brand-new story, reveal secrets from the show's second season, and tease developments to come. With removable items from the world of the show, the book will give readers a chance to hold a piece of the series in their own hands. Mr. Robot is a new kind of television show-one that explores, more realistically than any of its contemporaries, mental health issues, income inequality, data security, and corporate power, all through the lens of the generation just coming of age. The New York Times called it "relentless, sensational, and unabashedly suspenseful," the New Yorker called it "terrific" and listed it among the year's best TV, and Rolling Stone said it's "easily the year's most audacious drama" and the "best TV show of 2015." Stars Rami Malek and Christian Slater took home a Critics' Choice (R) Award and a Golden Globe Award, respectively, and the show itself received a Golden Globe Award and a Critics' Choice Award for best television drama. In Mr. Robot, Elliot Alderson is a troubled young computer coder who struggles with depression and paranoia. His day job as a cybersecurity specialist doesn't fully utilize his talents, so he turns to vigilantism in his free time as a "white hat" hacker, fighting for causes society fails to champion. He self-medicates with dangerous drugs, and, as he's drawn into the web of an anarchist known as Mr. Robot, we begin to understand the secrets he's been keeping from himself. Soon, Elliot's hacking skills plunge him into a battle to destroy a key center of society's power and finance-the world's largest, and most maleficent, corporation. At the same time, we see that Elliot has been anything but a reliable narrator, with the details of his past and damaged psyche surfacing in ways that endanger the entire world.